We have to reach a height where we work above our egoism and it doesn’t get in our way, where we rise above it and become completely free from it. Then there are no limitations left for a person. But for now egoism gets in our way, being “help from the opposite” since it helps me to reveal new desires, problems, and all kinds of flaws inside of me. This incites me to work and act, awakening various sensations in me and a change of states. If none of this existed, our state would be completely hopeless. That is why it is written that “The greater a person, the greater his egoism.” But as a person advances, he reveals a greater desire to enjoy, and inside of that same desire he reveals more and more details and finer nuances, evoking stronger impressions in him. This is called a greater will to enjoy. Reaching greater egoism means becoming picky and intolerant about the smallest things which I previously did not even pay attention to. And this spurs me to perform new, finer corrections, eventually bringing me to carry out very precise work against my egoistic nature. The Creator created the will to enjoy, being foreign to Him and to us. But this lets us feel one notion: our separation from the Creator as “something from nothing” (Yesh Mi Ein). There is nothing besides this in the will to enjoy. It includes just this one quality, and not an ounce of any desire. The Creator created just this one particular point, which emerged “from nothing,” being something completely separate. And from this separate point, the will to enjoy then begins to develop like a spiral that unwinds. Everything that is present in this desire, that comes out of the point of “something from nothing,” develops from the Creator, but in the opposite form, like an anti-world. The Creator created a certain point beyond His boundaries, which exists from nothing, and He brought Himself inside of it. It turns out that there is the Creator and the creation, standing one opposite another. And creation uses everything it has from this “nothing” in order to establish itself in the same status as the Creator. After all, in reality everything else besides this one point of “something from nothing” is the Creator. And “something from nothing” is the turning point in our mind and feelings, which we must always correct. Is Artificial Life An Act Of Creation? Opinion (Michael Casey, the author of The Unfair Trade, a managing editor at Dow Jones and The Wall Street Journal): “In the annals of world economic experience, 2009 was a terrible year. It was the first since 1945 in which global economic output contracted in aggregate. “Now, just three years later, we are on the verge of the same happening again. Data releases from around the world last week suggest an alarming, synchronized slowdown is underway. Another global recession so soon after the last one, at a time when an intractable debt crisis is tearing Europe apart while a divided United States is still reeling from the 2008-2009 financial meltdown, could easily undermine international trade relations and even threaten world peace. “The tensions have turned a breakup of the euro zone into a distinct possibility. If it comes to that it would be a global catastrophe. The international banking system that developed out of the pre-crisis global savings glut is too interconnected to withstand such an event without profound losses and extreme capital flight. My Comment: The proposed solutions can only be theoretical because the moment governments will start to undertake any changes, everything threatens to collapse completely. That is exactly what explains the inaction of the EU leaders. Everything takes place in the desire to receive, the only created being. And it is controlled by the Light that educates it and teaches it by everything that happens with this desire. The process begins from the fourth phase of the Direct Light from which we see that in addition to filling the created being that it created, the desire brings it to feel it, the Creator. Eventually the created being (the fourth phase – Behina Dalet) begins to feel that someone has created him and is now filling him, which means that there is something else besides the desire itself and the fulfillment. We don’t feel it in our lives, since we feel ourselves as phase one, at the beginning of creation: I have a life and I am alive. We don’t feel that we are receiving this life from someone and that is why we don’t develop above the first level, the level of the inanimate. The vegetative level already feels that its life is determined by someone’s desire, by some plan that leads to a certain goal. This means that it feels that there is a reason that leads to a process that leads to a goal. Thus two attitudes are developed in it: towards its condition and towards the one who provides this condition. The created being can feel good or bad, and at the same time feel that this good or bad feeling comes from someone. Accordingly, he develops an attitude towards this “someone.” Instinctively, he loves the one who causes him pleasure and he doesn’t like the one who makes him suffer. But thanks to the fact that he goes through many states, the created being begins to gradually accept the mental discernments along with the emotional impression. The mental discernments are formed in the created being thanks to the clarification of the process, the connection between the cause and the consequence, and by comparing the two. It is as if he begins to put a puzzle or Lego pieces together by putting together different parts, different states, by comparing them and connecting them with different reasons and outcomes. After feeling many pleasant and unpleasant states and seeing that they are connected, he understands that it is impossible to judge and to respond only on the basis of the initial emotional feeling since there is no such program in bestowal. There is a certain formula that connects the cause and the consequence, and so we can be in many unpleasant states that are useful and eventually bring about better feelings. Thus the ability to think begins to develop in us, and the thinking process appears. Together with the desires, the mechanism of the mind begins to take on a form, thus enabling a person to relate the process we are going through regardless of what he feels. We can already detach ourselves from our feelings and check these feelings by using the mind and relating to them objectively, as if from the side. This is how we begin to clarify our states. Question: Currently, we move from a linear, narrow-minded egoistic development to a “round,” whole world. How do we build the course of integral education in a way that it quickly shifts a person from a linear perception of the world to a global, universal perception? Answer: It’s easy! Everything depends on the influence of the environment! If the environment surrounding a person is integral, there will be a society built on top of specifically equal circumstances. Naturally, there are no equal people, but specifically equal circumstances will serve as a connection among them: friendly and equal, creating integral fields of communication around them where a person will feel as a part of the whole even if this feeling gradually disappears as the feeling of the whole will start prevailing. Then a person begins to perceive the world in a holistic way. And he will treat everything else outside of his small society as a whole, and he will be able to perceive the world correctly and interact with everything in a proper way. Phase two, Bina, is characterized by its understanding. Therefore, a person who attains it in his development begins to relate differently to what he feels. Even when he feels that he is in the dark, when he feels bad in the hardening of the heart, it is as if he is in a fog or a dark cloud, but at the same time he begins to acquire powers in order to detach himself from his feelings and to clarify them independently. This allows him to agree with what the Creator does with him and to justify the Creator’s actions, since the Creator wants to raise a person above his feeling and to let him see it from the side. It is because he is in a difficult spot now, feeling pain, that he can clarify it by the mind above his feelings. Then he can accept this dual state gladly, since on the basis of this dual attitude he can build a new state, which is higher than the previous state, and higher than his desire. Thus a person reaches the second phase (Behina Bet) instead of the first phase (Behina Aleph). He rises to the vegetative level and begins to move independently. He doesn’t just feel the good and the bad that come along like a lifeless stone that cannot respond at all, but begins to determine the state he is in by himself. He justifies the actions that help him advance and establish a relationship with the Creator, and determine the Creator’s treatment as the “good and the benevolent” in every state, including the states in which we feel good or bad in our egoistic perception. Now he is in contact with the Creator above all these states. But I want to develop further and attain such a state to “restrict” myself above the darkness. This means that I don’t care what I feel in my desire to receive; it doesn’t affect what I feel towards the Creator, the source. I don’t relate to the Light as to a pleasure like in the first phase that feels only pleasure or lack of pleasure. I bestow upon the Light like in phase two, I raise the Returning Light even higher, not because of a good feeling, but in order to adhere to the Creator above this feeling. This means that I unite with the process the Light puts me through, by which it teaches me to be constantly connected to it, to its plans, above all the good and the evil. Then I adhere to Him above my feeling. On one hand, the commandments “between a person and his friend” are more important than the commandments “between a person and the Creator,” since from the love of the created beings one reaches the love of the Creator. But on the other hand, we mustn’t forget the final goal: We must build the mutual relations among us correctly only in order to connect with the Creator. Otherwise, we would simply demonstrate “idealism” trying to overcome the crisis, to improve the educational system, to become better and happier people… All this is fraught with evil and leads to an even greater collapse. After all, by that we divert humanity from its internal part, leading it to a side road. Then people would feel even greater suffering trying to leave these attempts, no matter how wonderful they may seem. We want to stop the hunger and to make everyone healthy, to fill everyone with joy. But if at the same time we don’t aim at adhesion with the Creator, with the goal of creation, if we don’t intend to bring the Creator contentment and to enable Him to reveal Himself, then instead of the direct path upwards, we are choosing a side road, and then more sufferings would be needed in order to get back on track. The wisdom of Kabbalah uses only those terms and names which are real and reflect reality. This is an immutable law of all Kabbalists: “That which hasn’t been attained is impossible to name and define.” Until an object is revealed completely, as if you’re holding it in your hands, Kabbalists don’t call it attainment but something else like understanding, knowledge, and so on. In this manner, we attain a phenomenon to its very foundation, from the beginning of creation until the end, in every detail. And as much as we attain it inside our vessels of perception, to that extent we ourselves become enriched and complex in equal measure. After all, all the worlds are inside us and the entire picture appears within. I don’t study external phenomena but whatever occurs inside of me, and in the process, I understand myself more and more and realize to a greater extent that there is nothing outside of me. If before I saw the world as being outside, it was only due to a distorted perception, while in reality, it was a projection reflected in my brain. Ultimately, the spiritual attainment leaves no doubt, just like I don’t doubt basic, elementary things, such as how many fingers I have on my hand. And this is why it is written in different places that Kabbalah doesn’t require proof, since it cannot offer any proof to a person who is not in attainment. Words taken on faith won’t help here; a person needs to ascend to a level of attainment, to feel inside him or herself the screens, the Lights, and the vessels. Then he will see reality—see it firsthand with his inner sight. Then our world will suddenly appear to be inside as well. Indeed, as the desires are corrected, a person feels the facets and manifestations of the world inside him. When we work in a group, trying to bring the friends closer in unification, bonding, and Arvut (mutual guarantee) in order to become as one man with one heart, then through that, we prepare ourselves for that very same perception, which depends wholly on a person himself. And this is why spiritual attainment has no boundaries. All that we see outside transitions inward, becoming a part of us. Baal HaSulam, “The Essence of the Wisdom of Kabbalah”: This wisdom is generally divided into two parallel, identical orders, like two drops in a pond. The only difference between them is that the first order extends from Above downwards to this world, and the second order traverses from below upwards, precisely by the same routes and make-ups imprinted at the root when they appeared from Above downwards. The descent was in five stages, from the “root” phase (zero) until the fourth phase, and there are exactly the same stages on the way from the bottom up. Where do these levels come from? From the desire that the Light put through the same stages of development. So the structure is fixed and only the way it is put together is called development. Actually there is neither up nor down, we only discover the complexity of the relations between the Light and the vessel to a greater extent. First, when they were together, we could not discern it, later when it was opened, the picture became more complex because of the new details that were added to the levels of understanding of the Sefirot, the worlds, the Partzufim, etc. Later the Reshimot (informational genes) that were left after the descent are fulfilled during the ascent. 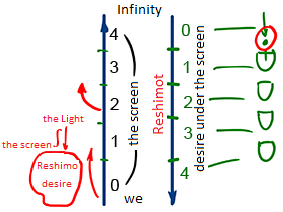 On the whole, there is a desire, a Reshimo, and the Light that influences both of them and which builds a Masach (screen), which means the level of compatibility between the Light and the desire. The Light is good and it is called the Light that Reforms since the desire because of the Reshimo wants something that is totally the opposite. If we still lead our desire towards the Light, we place it under the influence of the Light, and the Light turns the desire into a good desire. Question: According to the drawing, we begin the ascent from phase four, as if it were the first stage. How does this work? Answer: It is true that there are two opposites here. If we grow in our screen and in the use of the desire, we raise the levels of thickness (the depth of the desire), from the root phase to the fourth phase. We descended the levels of the desire under the screen, and we raise the levels of the screen itself. In any case, while moving towards this world the use of the desire decreases. Phase four below doesn’t symbolize the level of the “matter” of the desire, but the work we have to do with it. So we begin the ascent with a small desire since we don’t feel the “matter” itself, but rather whether there is a screen above it. We attain the perception of Holiness or impurity, but not the desire itself. Question: Why do you think that Kabbalah is the foundation of all religions and that religions appeared because Kabbalah was concealed? Answer: Abraham’s religion is love towards everybody. On this basis he organized a group of students in Babel. This group existed in this quality (of course, not without the problems in realizing this condition, yet with the desire to reach it) until the final victory of egoism 2000 years ago. In the end, as egoism surpassed altruism, they fell from the relationships of love to the relationships of hatred. In the end, the sensation of the upper nature, the Creator, disappeared from them. Having been left in darkness, they resorted to guesswork concerning the upper world, the goal, and the purpose, and this gave rise to the creation of far-fetched theories, which over time became religions: Judaism, Christianity, and Islam. However, the biggest problem with the Creator’s concealment is that all religions separate people and evoke in them if not hatred, then at least rejection and disregard.